FULL-SERVICE DEMOLITION AND ABATEMENT AT YOUR SERVICE. FROM WRECKING AND INTERIOR DEMO TO ENVIRONMENTAL REMEDIATION, WE’RE READY TO GET THE JOB DONE. Clear the way for new opportunities. We have a proven track record for safe, efficient removal of interiors and environmental disposal of all waste. Kick off your next project with safe and efficient demolition. 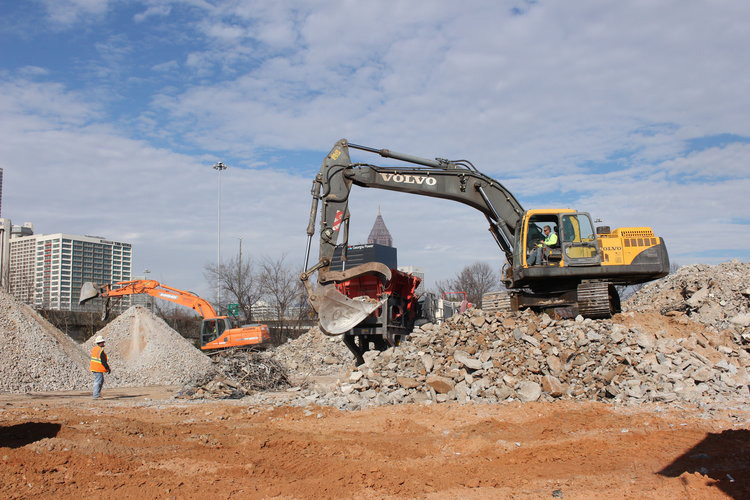 Rapid and professional total structure removal that meets your budget and schedule is a top priority for Green Circle Demolition. Minimize risk and maximize productivity with professional concrete crushing. We have the equipment and expertise to turn your concrete into a variety of usable products. We own and operate a variety of crushing and screening equipment to extract value from your materials. Manage your environmental remediation risks. We can help remove the burden of regulations and paperwork associated with environmental projects, and you can rest easy knowing that you have an experienced partner protecting you and your assets. You can rely on us to complete your project safely. We pride ourselves on a culture of safety that has allowed us to operate for over 120,000 hours without a single lost time incident.